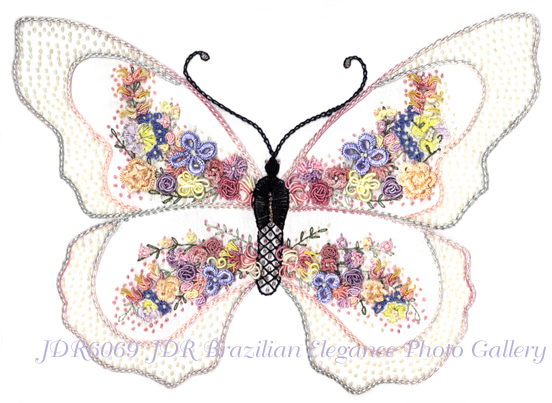 Butterfly Adorned in Flowers "Delicate Beauty"
Stitching Area: 6.5" x 7.5"
Intended Finished Size: 10" x10"
Apx. 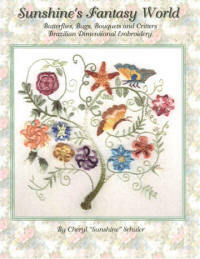 Fabric Cut Size: 15 x 15"
Knowledge of basic Brazilian Embroidery stitching techniques is assumed. Stitches used in this design: Pekinese stitch, Back stitch, Blanket stitch, Chain stitch, Straight stitch, Stem stitch, Cast-on, Bullions, Lazy Daisy, Pistil stitch, Detached buttonhole, Bullion tipped lazy daisy, French knot and just a little Turkey stitch. ♥This design package includes screen printed design on Trigger fabric (water soluble ink), directions, color picture and thread list. 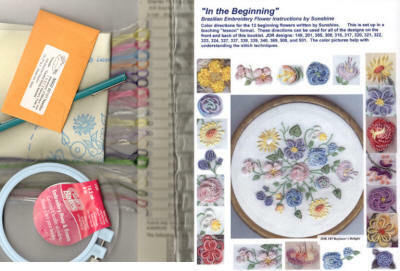 I have also listed the EdMar colors at the bottom of this page. Colors that were used in the sample are listed below. The following colors are what were used in the sample – but please feel free to choose your own colors! Body, Head & Antennas: Lola 206. Quick List: Great for matching and choosing dye lots.